The Bottom Deal Count is a method developed for the placing of cards in any desired position under the guise of counting the cards. It also, under certain conditions, is a perfect cover for the bottom dealing of a single card. It is ideal to use in a demonstration of the game of Pinochle as the method of giving out the cards conforms to this particular Bottom Deal. The grip usually described uses the Erdnase method while the one to be described here uses the Master Grip and Deal. 1. Let us suppose that you have a packet of twenty five cards, the bottom four of which are aces. It is your aim to set these aces to the tenth, fifteenth, twentieth and twenty-fifth positions during the innocent action of merely counting the packet. 2. 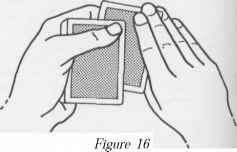 Hold the deck in the left hand in the Master Grip with the left thumb pushing the top card off to the right as in Figure 3. 3. The right hand moves over to the left to take the card and seize it with the right second finger at the face of the card and thumb on top. As the right hand is withdrawn, the card is pulled in, by the right second finger, more towards the right palm where it now will be supported by the curled right third finger from below and the thumb on top as in Figure 9 which shows several counted off cards in this position as seen from the bottom. under each other. At ten, the three fingers of the left hand move out the bottom card as already explained. The cards in the right hand will cover any movement and stealing of the bottom card. 6. The bottom card is more or less whipped out from under the left hand packet, beneath the bottom of the right hand packet. This action is accomplished solely by the movement of the right second finger. The left three fingers merely move the card to an easily accessible position as in Figure 9 which also shows the two hands about to come together and the left second finger ready to whip out the bottom card. 7. At the same time, although no card is taken from the top of the left hand packet, the combination of sound and movement creates the illusion that the top one is taken, just as the regular false count does. 8. After the bottom card is taken at the count of ten, the next four cards are taken fairly off the top until the number fifteen is reached whereupon the Bottom Deal Count is again executed. 9. The counting process is continued with the Bottom Deal sleight made on the number twenty. Naturally, the last ace will automatically be the last or twenty-fifth card and no sleight is needed. 10. The Aces are now set at the tenth, fifteenth, twentieth and twenty-fifth position as intended. As in all counts, false or otherwise, it is absolutely necessary to perfect the action to the point where there is no interruption in the regular rhythm of the count. This however, also means not to exceed your normal rate of speed in counting. It will now be shown how, using the same Master Grip and Deal, one can also practice the strike method of bottom dealing. 1. Hold the deck in the left hand in the Master Grip position except the left three fingers are moved down and away from the left forefinger so that a slight gap is open between forefinger and second finger. 2. The top card is arced over the side in the approved manner as the right hand, in the Master Deal position, approaches the deck to apparently take the top card. 3. Actually the right thumb falls on the top card but the right second finger-tip goes into the slight opening, between the left first and second fingers, to contact the bottom card at the upper right corner. Remember only the tip of the right second finger should be on the bottom card. Do not dig the whole finger under the deck. 4. With the tip of the right second finger resting on the face of the bottom card and the right thumb on the top card, you are ready for the withdrawal of the bottom card as follows. 5. The right second fingertip presses inward, towards the body, on the upper right corner of the bottom card. This inward pressure will cause the corner of the bottom card to escape from under the left forefinger. Once the bottom card is no longer kept by the left forefinger it will be found an easy matter to withdraw it. 6. The three left fingers at the side of the deck play an important part in letting the card come out with the least possible noise. As the right second finger starts to withdraw the bottom card the left three fingers sort of rock back by bending at their first knuckles. In other words, the left three fingers which will normally be curled around the side of the deck, will straighten out at the first joints only as in Figure 10, This shows the bottom card being drawn past the left fingers. Notice the left fingers remain curled overall and do not straighten or extend. Keep in mind that the left three fingers do not straighten out fully to look like a bunch of bananas but rather are straightened very slightly at the first joints only. By bending the first knuckles inward this slight straightening rocks the tips of these fingers away from the top side of the deck and carries them nearer the bottom where the bottom card, upon being pulled out, rides over them. The basic idea of this count has been fully explained in the Bottom Deal Count using the push-out method. This then, is the same sleight except that a strike technique is used to whip out the bottom card at the proper number. 1. Hold the packet of twenty-five cards in the Master Grip, aces at the bottom, The left thumb pushes over the top card. 2. The right hand moves over to the left to take the top card and seizes it with the right second finger on the face of the card and thumb on top. 3. 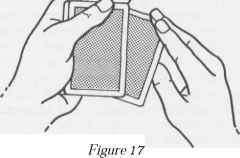 As the right hand is withdrawn, the card is also pulled in, by the right sec ond finger, more towards the palm where it will be supported by the curled right third finger from below and the thumb on top exactly as in the first method of Deal Counting, shown in Figure 9. 4. The cards are taken under each other during the count. This count is fair until you reach ten. Then the right second finger-tip goes under the packet, in a position similar to that of the Strike Bottom Deal. 5. The bottom card is now more or less whipped out from under the left hand packet to the bottom of the right hand packet. This action is accomplished solely by the movement of the right second finger. The left three fingers, of course, rock back as in the Strike Bottom Deal, to enable the card to pass over them. 6. At the same time, although no card is taken from the top of the left hand mcket, the combination of sound and movement creates the illusion that the :opone is taken. The counting process is continued with the Strike Bottom Deal Count executed at fifteen and twenty while the wenty-fifth is, of course, the last card. The aces will now be set at the 10-1520-25 positions ready for the deal. A comparison of both methods will show that the manner of holding the packet is in each case identical as well as the method of taking the top card. Before proceeding with the Second Deal re-read the first pages of this chapter. Note especially those points about the swing, bevel and speed. Note that in the second deals to be described the Master Grip and Deal are still used throughout. It has been stated that the strike method of dealing can easily be spot ted. This is not the fault of the basic principle but rather of those methods that have been taught. As long as these texts keep insisting that you strike the second card out, the deal will always be open to suspicion because in order to strike out the card the right thumb and second finger invariably separate too much and look like a pair of tongs about to nip a cake of ice. Another great fault that is usually mastered along with the strike, is that of the right thumb going across the end of the pack for almost its whole length causing a sweeping motion wide enough to blow the rest of the cards off the table. Yet with all its faults the strike method could still be a wonderful deal if it weren't for the "Look how clever I am at taking the second card" attitude of some magicians. 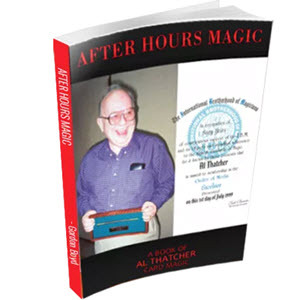 I say magicians simply because I feel that a cardician is much too smart to thus expose himself to his audience. And if he must demonstrate his skill at second or bottom dealing under pressure from his brethren he will wisely choose the inferior methods to show offwith. All this brings us to the second deal technique which we call the Take Method. If the student follows the instructions for this deal he will find that between it and the two card push-off, which will be gone into later, there will be little appreciable difference. As a matter of fact, one can switch from the "Take" to the "Push Off with no noticeable change in the style of the deal. 1. As always hold the deck in the left hand in the Master Grip position. Left thumb pushes over the top card and in case one has forgotten how, refer once more to Figure 3. 2. The right hand approaches the deck in the Master Take position. 3. As the right hand comes to take the top card the right thumb and second finger separate only slightly. 5. At this point either the top card can be dealt off or the second one taken. If the top card is desired, the right second finger, from below, nips the top card against the ball of the right thumb and carries it off the pack. On the other hand if the second card is desired the tip of right thumb presses down on the second card as the right hand moves to the right, dragging the second card because of the applied pressure. The right second finger nips the 2nd card from below as soon as the corner of this card is out far enough off the deck. 6. At the same time that the second card is being drawn off, the top card is swung back to the left with the left thumb. Remember that the second card is not swished out but taken out. Once more, I will repeat that only the tip of the right thumb, that part above the ball of the thumb, presses down on the second card causing it to more or less adhere to this thumb as the right hand moves back to the right. The right second finger is very close by to immediately help the right thumb nip the upper right corner of the second card as this corner moves off the deck. The right thumb always falls in the same position whether the second card is taken or the top one. Just once more -take that second card, don't hit it. 1. The cards are held in exactly the same manner as for all the previous deals with the exception that the left thumb moves up further towards the upper end of the pack until the tip of the thumb protrudes slightly above it as shown in Figure 11. 2. Push the top card clockwise in the usual way until its upper right corner projects, for about a quarter of an inch, over the pack. At the same time it will be noticed that the tip of the left thumb now rests on the second card while the ball of the thumb is on the top card. 3. Press the tip of the left thumb downward on the second card while at the same time push the cards still further over the upper right corner of the deck. This will result in two cards projecting beyond the deck with the top one slightly in advance of the second one as depicted in Figure 12 which is exaggerated for clarity as only all white will show if using a white border deck. 4. The right hand, in the Master Take Position, approaches the deck and places the tip of the right thumb directly onto the upper right corners of the two cards while the right second fingertip assumes a similar position from below. corner between the tips of the right thumb and second finger, then carried away. In taking the top card the right thumb exerts a slight downward pressure on this card while the right second finger rests rather loosely on the bottom. Once the right thumb has started the card off the deck, the right second finger comes up to help nip the card. These actions of course, are so slight as to be unnoticeabie. 6. Should the second card be desired, more pressure is put to bear, with the right second fingertip from below, on the second card while the right thumb loosely touches the corners of the top two projecting cards. The second card is started out by the upward pressure of the right second finger-tip, as this hand moves to the right, while the right thumb rides loosely over the top card, then automatically makes contact with the second card as the deal is concluded. 7. Once the second card has been withdrawn the left thumb moves back the top card but only slightly, not enough to cover the card below it but with the new second card's upper right corner still showing. In this way the tip of the left thumb can again make contact with the second card at this corner. 8. Although all three left fingers are at the side of the deck it is the left second and third finger-tips that do the major portion of controlling, preventing more than two cards from being pushed over the side of the deck. The left thumb once again moves two cards over the upper right corner of the pack, where the right hand can once more take its choice of the top or second card. The great difficulty in the two card push-off second deal is the ability to transfer from a top card deal to the second deal and vice versa without any break in rhythm. This problem is easily solved by always pushing two cards forward regardless of whether the second card or top card is taken. In other words, with the two cards advanced as in Figure 11, after the top card is taken, it will still leave the second card projecting and the upper right corner of the deck exposing the new second card. All that has to be done is for the left thumb to move back, engage this new second card with its tip, and push forward two cards again. This is repeated each time a top card is taken thus you are always ready to go into the second deal. Naturally, on the second deal you will still be pushing over two cards; therefore the action will look normal throughout whether dealing the top or second card. A final word of caution. Do not make the mistake of striking out the second card with the right second fingertip as is commonly done but rather give the impression of taking the card in much the same manner as in the Take Second Deal. Take method, finally finish off with the Double Deal and the Bottom Deal Count. The deals that will be dissected at this point still use the Master Grip as in the previous Deals; however, the manner of taking the card with the right hand is changed to conform to those actions usually associated with the game known as Stud Poker. Once having mastered the most important principles of the previous deals the practitioner will find little to stand in the way of his acquiring the added skill necessary for the Stud Deals. One of the first deals of the Stud type that I devised was a bottom Stud Deal known as the "Havana Deal" and was sold by the Ireland Magic Co. While I'm on the subject I may as well clear up the question of "Who is Manuel Pedro, the Cuban gambler?" Actually, there never was such a person but then this is getting ahead of the story which I believe must contain some moral. For many years I had seen many methods of Stud dealing and in most of them the top card is always taken off the deck, by the right fingers going on top of the card and the thumb below on its face. The card is now brought face up by turning the right hand inward towards the body and palm up. In this way the face of the card is seen first by the operator, then by the players as the card is thrown face up onto the table near the player's hole card. Now, this action of Stud dealing I knew had been successfully duplicated as far as its application to second dealing was concerned; however, no such satisfactory method was available for the bot tom deal. Strictly on my own I decided to experiment and the result was a very I deceptive bottom Stud deal that has i since proven its worth in the fastest of J company. So pleased was I with my method I showed it to Laurie Ireland who took to it immediately. For the next two years no more was said about it until one day Laurie said to me, "You know that Stud Bottom is a good thing. I think we ought to market it before it gets kicked around too much." I acquiesced and the deal was set. The big problem arose now. How could a sheet of instructions describing a sleight, a bottom deal at that be sold? It was then that Francis Ireland came up with the idea of making it look as if the deal was a jealously guarded secret of some gambler. As Laurie actually was in Cuba at one time, Francis set the scene for the introduction of her fictitious character, Manuel Pedro. Thus the Havana Deal was born. So well had Francis done her part that even to this day Manuel Pedro is a real honest-to-goodness gambler who imparted to us cardicians his most prized possession, the Havana Deal. Oh yes, the moral to this story is simply that when the magicians buy a method that is supposedly being used by a professional gambler, why it's great, it's terrific, it's actually used by the gambler. On the other hand, if it is known that a brother cardician is responsible for it the arguments usually go something like this. "It will never work", "You cant get away with it", "The guy's talking out of his hat." Under these conditions you can't blame us for inventing a myth. Who knows, maybe Erdnase was a magician. Stud Bottom that has been devised since the innovation of the Havana Deal. 1. Hold the pack in the left hand in the Master Grip position. The top card is pushed over by the left thumb in readiness to be taken by the right hand. 3. As the right thumb peels off the top card it automatically goes against the fingers of the right hand. The right hand immediately turns back up and tosses the card face up onto the table. This then is the Stud Deal action that should be simulated throughout whether the top card or bottom card is being taken. It is also important that during the deal the first two phalanges of the right fourth finger brush against the face of the bottom card at its lower right corner. In this way the dealt card will end up being held, more or less, between the right thumb on top, fourth and third fingers below or on the face of the card. 4. The above deal is continued until the bottom card is needed. At this point the left fingers push out the bottom card as prescribed for the Push-Out Bottom Deal. This will result in the bottom card being free enough so that as the right fourth finger brushes against its face, at the lower right corner, the card will be pulled upwards and out as in Figure 14 which shows the right side view of the action. The left thumb holds back the top card. This results in the right thumb slipping from the top card onto the bottom one where it nips the card against the right fourth and third fingers. 5. Follow through by turning the right hand back up and dealing the card face up onto the table. The left thumb pulls back the top card flush with the deck simultaneously with the bottom deal. The bottom cards can be dealt with less chance of detection in the Stud Deal than in the normal deal as the turning of the cards face up draws the attention to them and away from the deck itself. Those who know the mechanics of the Havana Stud Deal can improve it considerably by using the above method of pushing out the bottom card but tak ing it with right hand in the Havana manner. As this is a marketed item we are not at liberty to detail the action of the right hand in this case. As in the Second Deal one must be careful in not making the Stud action a striking one but rather as if taking a card. Also eliminating all points already discussed, such as swing, bevel, etc. apply as well to the Stud Second Deal. Hold the pack in the left hand in the Master Grip position. The left thumb pushes over the top card in readiness for the right hand to take it. 2. The right hand is held palm down as it approaches the deck and the right second finger is placed across the upper right corner in such a manner that the tip of this finger rests on the exposed corner of the second card. The right third finger should be below the projecting corner of the top card with the fourth finger alongside it. The right forefinger and second finger will lie across the left thumb with the right forefinger resting across the left thumb knuckle and the right second finger resting across the left thumb nail. fers, lying across the left thumb, will e at such an angle as to prevent the second finger from coming in contact with any portion of the top card. The hands at tnis point are in the position shown in Figure 15. Note that the right thumb is below the palm and touching the side of the left fourth and third fingers. fer and the tip of second finger, as in igure 16 which also shows the direction the second card takes as it is being pulled clear of the top card. The right thumb is below the card lightly touching its face. upwards on the face of the card at its upper right corner. As the right thumb applies the pressure to this corner, the right third and fourth fingers move in towards the palm of the hand with the result that the card will end being held face up between the right thumb at its lower index corner, first and second fingers on the back of the card at this same corner. 5. 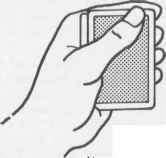 The turned up card will wind up being held a few inches to the right of the deck but this position is not held for long because almost immediately the right fingers toss the card forward onto the table before the spectator. 6. The Second Stud Deal can be continued by repeating the actions outlined. At anytirr^rthat the top card is needed, the right second finger does not press down dn~T:he second card but merely brushes past it and straightens out slightly to come in contact with the top card. As the top card is taken off it is clipped between the third and fourth fingers, carried off the pack, turned face up and dealt onto the table in the same manner that the second card was handled. Once the proper amount of practice has been put in, it will be found an easy matter to deal either the top card or second without any apparent change in the action. This Stud Deal is one to be used in conjunction with the two card push-off second deal. The mechanics of the left hand are identical to that of the Two Card Push Off Second Deal already described. Only the action of taking the card with the right hand is changed. 1. Hold the pack in the left hand in the Master Grip and deal over the top two cards, as detailed for the Push Off Second, in readiness for the right fingers to take either one. 2. The right hand, in position for the Master Deal, approaches the deck but instead of grasping the cards between the second finger and thumb they are clipped between the right second and third fingertips in the same way as in the Strike Method except here the Two Card Push-Off makes this even simpler in execution than the strike in getting that second card. Note that the right thumb is already going under the face of the card in readiness for turning it face up as shown in Figure 17. 3. The underlying principles of taking the second or top card are identical with those of the Push Off Second. Whenever the second card is desired the right third finger applies the pressure to the under card. If the top card is wanted the right second finger applies the pressure to the top card. These pressures are of course, applied during the time the right hand moves to the right, then the proper card is clipped and dealt face up onto the table. Once the student has mastered the bottom deal or second deal he may conclude that he now is proficient in the art. This, however, depends entirely on the way that he has practiced. However, if he follows these further instructions he will have started out on the right track and eventually may be able to say he can deal. To become proficient in dealing one must learn The Sail" which is the means whereby the card is projected in front of the various spectators seated around a card table. Any one who plays cards a lot has in all probability already acquired it; however, we will describe the action in case the present company is unaware of it. 1. The top card is taken between the tips of the right second finger and thumb. This hand is in the Master Deal position with the right third and fourth fingers curled into the palm. 2. The right third and fourth fingers, which have been curled into the palm, now move out until the first knuckle of the third finger touches Jhe^ right side of the card. 3. These two fingers now straighten or kick out suddenly against the side of the card causing it to be sailed or spun across the table as the right thumb and second finger release their hold on the card. 4. Just before the Sail, the right hand moves forward slightly in the general direction in which the card is to be propelled. In other words, if the card is to be dealt to the left the right hand moves in that direction for only the shortest distance. The rest of the space is covered by sailing the card towards its destination. 5. Do not make a regular pin-wheel of the sail but rather a flutter. Only for exhibition purposes, in connection with the sleights labeled for this type of showing off is the Sail exaggerated. 6. During the deal the left hand remains as stationary as possible with the right hand always coming back to take the next card from the deck. In other words, do not make the mistake of shifting both hands in the general direction of the deal. 7. These identical maneuvers apply of course to the various bottom and second deals as well. They should be practiced by dealing to the extreme left, to start, then continue in a semi-circle towards the extreme right and finish in front of the dealer. Try to visualize the tempo of the deal always remembering that many things may be lying around the table that will normally slow down any dealing. Once the student the rea sons for the seven steps outlined he may consider himself on the right track as far as dealing seconds, bottoms etc. is concerned. Using the Master Grip and the technique of the Pushout Bottom Deal a very deceptive one hand bottom deal is possible. Although it can be mastered with a full pack it is a lot easier with fewer cards, about half the deck. For that reason we believe it will be more practical whenever there is an excuse for handling fewer cards, as in some card tricks. First off it will be described as if one were to practice it in connection with the Sail, using two hands, The one hand bottom deal is always made on the deal towards one's self as it is this action that makes it deceptive. 1. Hands are well forward on the table with the elbows resting on the back edge of the table. The deck is held in the left hand in the Master Grip position. 2. Assuming you are giving an exhibition of a five handed game, the top four cards are sailed off to the other players, using both hands, during the deal. 4. The inward swing of the left hand towards the body, plus the sudden stop, will propel the now loosened card off the bottom and to a point out in front of the operator. The action is completely covered by the back of the left hand as it swings towards the body. 5. The One Hand Bottom Deal can be repeated on each successive deal and is fairly normal as many players have the habit of sloughing off thiTtbp card with one hand when they de^d_tp themselves. A count trick usin^ the One Hand Bottom Deal can be made practically indetectable if performed in the manner as described.